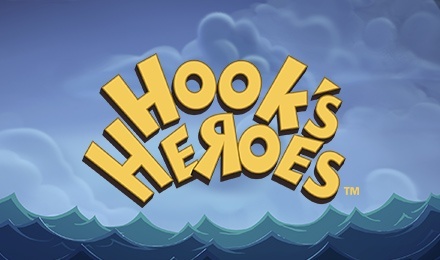 Take to the seas and win big when you play Hook’s Heroes Slots at Moon Games! There are FREE spins, EXTRA Wilds, multipliers and more! Ahoy! Go on an adventure at sea when you play Hook’s Heroes Slots – your treasure awaits! Captain Hook is this video slot game’s Wild, and can help create winning lines. You’ll also want to look out for the game’s Scatter, because 3 or more will activate your FREE spins! Plus, there are 3 special Features that you can select with your FREE Spins Bonus for extra Wilds, Multipliers and more! And, with an RTP of 96.82%, Hook’s Heroes is irresistible!